Getting home from a Friday or Saturday night out in Broadbeach is now safer and easier, thanks to the relocation of the Broadbeach secure taxi rank. The secure taxi rank has been relocated from Victoria Avenue to Surf Parade to accommodate more taxis and improve traffic flow. Mayor Tom Tate said the new secure taxi rank can now hold up to eight taxis and safely accommodate hundreds of additional taxi patrons. “It provides a safe and secure environment for waiting passengers and taxi drivers. Security measures such as four new safety cameras and additional lighting have been installed to help reduce anti-social behavior. “We want people to enjoy the vibrant nightlife the Gold Coast has to offer. There are four secure taxi ranks operating in the city each with a dedicated security guard and marshal, so residents and visitors can plan their night out and get home safely,” Cr Tate said. The secure taxi rank at Surf Parade, Broadbeach will operate on Friday and Saturday nights from 11pm-5.30am. The Broadbeach taxi rank is the busiest rank on the Gold Coast, with approximately 9,000 patrons per month. The secure taxi rank was relocated from Victoria Avenue to Surf Parade reflecting increased patron demand. The new location provides greater taxi rank capacity and improved traffic flow. Outside of Friday and Saturday nights from 11pm-5.30am, the taxi rank will stay at its existing Victoria Avenue location (outside the Oasis Shopping Centre). additional lighting at the back of the toilet block. The joint project has been made possible through the Federal Government funding through the Safer Suburbs Program Taxi Security Scheme of $106,000. 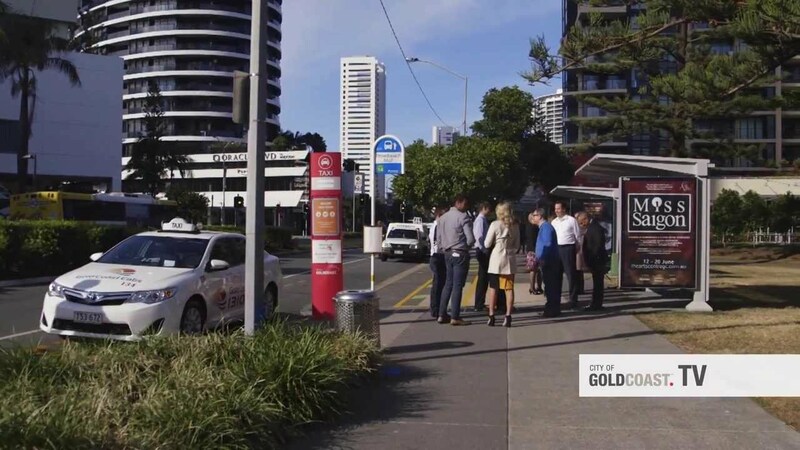 “This year, we’ve invested $2.4 million on a range of public safety initiatives, with almost $1.6 million going towards 24/7 monitoring of our safety camera network, including the cameras at the Broadbeach secure taxi rank. It’s a key investment in public safety, confidence and crime prevention,” Mayor Tate said.